MANILA, Philippines - "A historic and patriotic ‪#‎DuterteSONA‬ awaits today." This is a strong preview of President Rodrigo Roa Duterte's first State of the Nation Address (SONA) today, July 25, 2016 at the Batasan Pambansa in Quezon City. On this page, check out details on how to watch live streaming online, time of the event and expected highlights of his speech. The president is expected to deliver his SONA at the plenary hall around 4 p.m. The live streaming video and pre-program will be available by 2 p.m. or earlier. At 10 a.m., the lawmakers will proceed to the plenary hall to mark the beginning of the 17th Congress’ session. All guests are expected to arrive early in the afternoon. Duterte will be welcomed by the Senate President and House Speaker as he arrives at the House of Representatives. The President will then stop by at the Presidential Legislative Liaison Office (PLLO) before proceeding to the Session Hall for the joint session of Congress. How to watch SONA 2016 on live stream? Radio Television Malacañang (RTVM) has provided a live stream video of SONA 2016 and it's now available online. The SONA’s highlight is the President’s speech. “The speech would probably last based on our online application to calculate our actual time is more or less 38 minutes. If you would include the applause and some ad libs by the President, it could take longer,” Andanar added. Acclaimed director Brillante Mendoza has been tapped to direct the event, pro bono. Expect heavy traffic at the vicinity of Batasan Pambansa today. 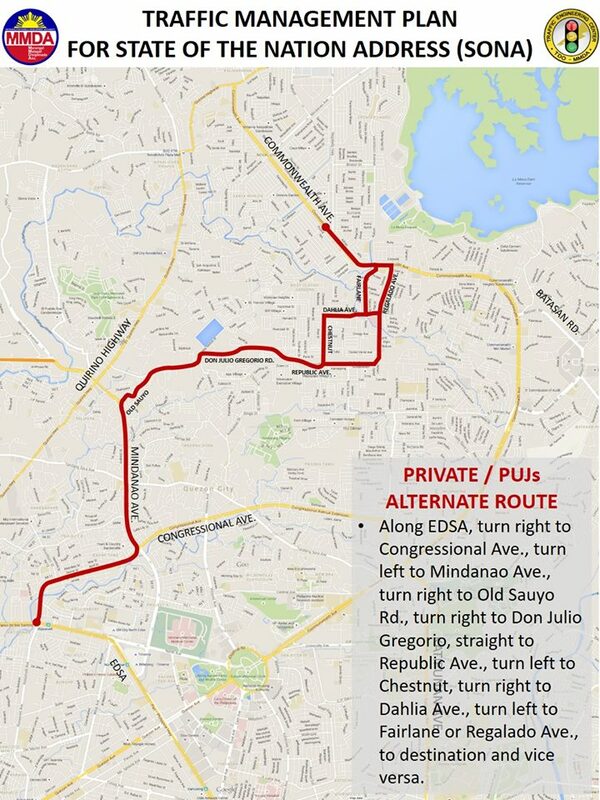 Check out alternate road schemes according to the Metropolitan Manila Development Authority (MMDA).